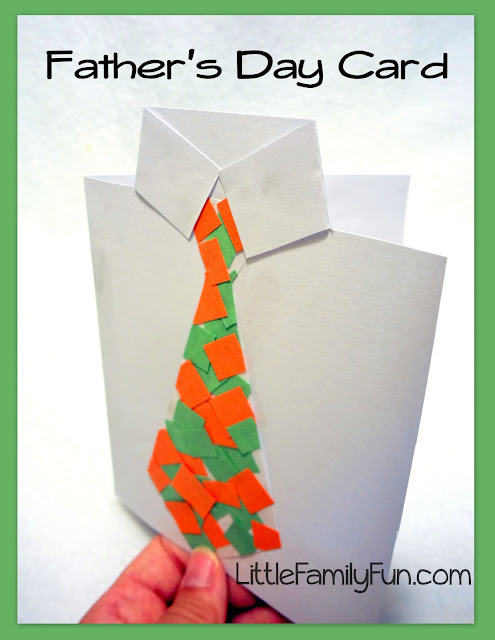 My boys had fun making the crazy paper-collage tie for this Father's Day card using their current favorite colors! Cut out a piece of cardstock and fold it in half. Cut out a tie shape using cardstock, and small squares using construction paper. Glue the squares all over the tie and trim the edges. Glue tie onto the middle of the card. Then write a message inside! This is such a cute and fun project! Thanks for sharing it. My 3 year old is making the tie right now for her daddy.